Johnny Law pictured with Derry City manager Kenny Shiels. 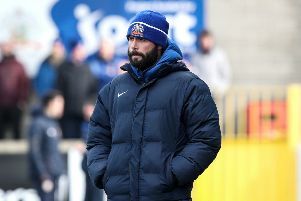 Portstewart have moved quickly to appoint a new manager following the departure of Gary Taylor with former player Johnny Law taking over at Mullaghacall. Long-serving boss Taylor announced earlier this week he was stepping down from the post due to personal reasons. However the Seahawks have moved to secure the services of Law, who had been manager of Coleraine Under-20s. A statement from the club said: "Portstewart Football Club are delighted to announce Johnny Law as their new manager. "After spells with Glebe Rangers and Tobermore United Johnny takes the helm at Mullaghacall after spending the last six years as manager of Coleraine FC Under-20 side. "Bringing a wealth of both management and and playing experience Johnny has shown the desire to challenge for honours and take the club to the next level. "The committee are delighted to have Johnny on board and urge the Seahawk family to get behind the team and new manager at every opportunity as they push for silverware."